The Design Laboratory was a pioneeting school sponsored by the Federal Art Project (FAP), a program of the WPA. Founded in New York in 1935, it was the first US institution to offer comprehensive education in modernist design. Yet the Design Laboratory was more than a school for commercial artists. 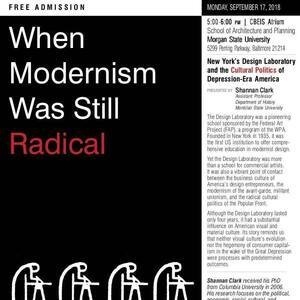 It was also a vibrant point of contact between business culture of America's design entrepreneurs, the modernism of the avant-garde, militant unionism, and the radical cultural politics od the Popular Front. Although the Design Laboratory lasted only four years, it had a substantial influence on American visual and material culture. Its story reminds us that neither visual culture's evolution nor the hegemony of consumer capitalism in the wake of the Great Depression were processes with predetemined outcomes.